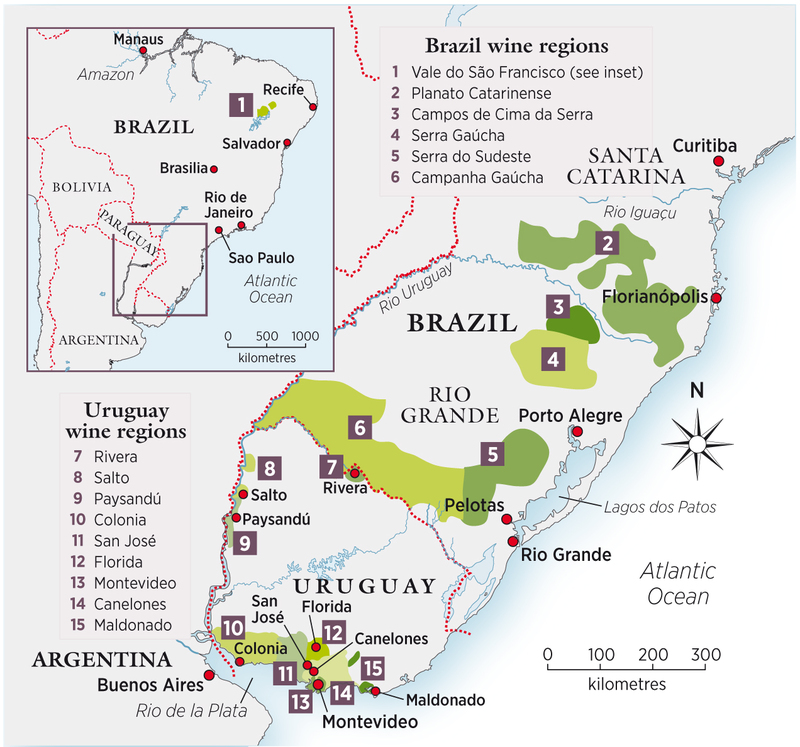 The largest country in South America, Brazil is the fifth-largest wine producer in the southern hemisphere, behind Argentina, Australia, South Africa and Chile. Its vineyards cover an impressive 82,000 hectares, yet, while expanding significantly, only 10,000ha are planted to vitis vinifera. And although a certain volume of wine is exported, this accounts for only 10% of its output. The country is more famous for sport than wine, and with the football World Cup this summer and the Olympics in 2016, producers are determined to take advantage. I feel their efforts won’t be in vain. Serra Gaûcha: Known as ‘little Italy’ because the estates are mostly owned by third- and fourth- generation Italians, following an exodus from the Veneto at the end of the 19th century, this region accounts for almost 85% of Brazil’s fine-wine production. As such it will remain the focus of the country’s wines, even while the smaller regions are expanding. here, two hours north of the bustling city of Porto Alegre, is the country’s only Denominación Origen, Vale dos Vinhedos; and the recently created geographical Indication of Pinto Bandeira, famous for its traditional-method sparkling wines. Vines are planted at 450-750 metres above sea level, and soils are varied, with a high proportion of basalt. summer temperatures average 22 ̊C, with mild nights that suit the Bordeaux varieties Cabernet sauvignon and widely planted Merlot and Cabernet Franc, as well as Tannat and Pinot Noir, for the reds; Chardonnay, Viognier, Riesling and sauvignon Blanc for the whites; and Moscato and Malvasia for sweet and Charmat-method sparkling. Campanha: Situated on the southern border with uruguay, the vines in ‘New horizons’ (as the region is known) are planted 200-450 metres above sea level on mainly granite and limestone soils. Temperatures are high, ripening grapes perfectly, and suit Cabernet sauvignon, Tannat, Touriga Nacional, Tempranillo and, to a lesser extent, Merlot and Pinot Noir for red; and Chardonnay, sauvignon, Pinot gris and gewurztraminer for whites. Plantings of these and new varieties continue to increase. Serra do Sudeste: A small region north of Campanha, south of serra gaûcha and nearer the ocean, with similar elevations, temperatures and soil. Cooling sea breezes bring complexity and balance, and have encouraged plantings of Ancelota, Alicante Bouschet, Barbera, gamay, Malbec, Marselan, Periquita, syrah, Teroldego and Touriga Nacional, alongside the classic reds, and adding Malvasia and Riesling to the whites. Planalto Catarinense: To the north of serra gaûcha and known as ‘The highlands’, this is the newest, highest (at 900–1,400 metres) and coldest wine region in the country. so far, just Cabernet, Merlot and Pinot Noir are planted for reds, and Chardonnay and sauvignon for whites, producing balanced wines with fresh acidity. Riesling will likely join them soon, with possibilities for ice wine. Vale do São Francisco: Some 3,000 miles north of serra gaûcha lies ‘The New latitude’, the only one of the five regions where irrigation is necessary and where the sedimentary soils from the san Francisco river produce two harvests a year, the vines undergoing a 120- to 130-day cycle. Temperatures are high – 20 ̊C in winter and 31 ̊C in summer on average. Alicante Bouschet, syrah, Tempranillo, Touriga Nacional and Cabernet sauvignon survive the heat, as do Chardonnay, Chenin Blanc, Malvasia and Moscato, the latter for a Charmat-method sparkler. I first visited Brazil five years ago for a wine fair, and apart from some well-made wines from Salton and Miolo, the oldest and largest producers, and some very individual ones from Lidio Carraro, I was not overly impressed – it seemed worlds away from Argentina and Chile, even Tannat-dominated Uruguay. This year, on my first visit to the vineyards, I was both impressed by the present and excited for the future. The main producers, big and small, and mostly with European backgrounds, respect their vineyards, and the GTGT (grape-to-glass transfer, John Livingstone-Learmonth’s phrase for characterful wines) was not stymied by oak, alcohol nor over-ambitious winemaking. Diversity was the key. Of course, these wines were all new to me, but the difference in taste and flavours, while avoiding excess of any kind, save for sweetness of the sparklers for the local palate, was a joy. There are some serious wines that will compete on the international scene, but what I was left with was an impression of varietal-vineyard wines, mostly fruit-dominated, with balance and charm to enhance any meal. The climate, particularly in Serra Gaûcha, with its cooling sea breezes from the Atlantic, can suit French, northern Italian and northern Spanish grape varieties. Currently Merlot dominates the reds, but Malbec and Tannat are increasing, more in blends than on their own, as is Tempranillo. The cool nights suit Chardonnay and Pinot Noir, the latter having a small but exciting future – for lovers of the world’s most capricious grape, Brazil will produce some great surprises. Perhaps its most ‘fun’ grape is Moscato (thanks to the Italian influence), of which many clones are planted for Charmat- method sparkling wines, mostly off-dry and so full of exuberance and fruit as to be irresistible.